Daisen G Beer White IPA is a 7.5% wheat ale from Kumezakaura Shuzo, based in Tottori, Japan. Don’t adjust your set – I did say a wheat ale and we’ll come back to that later. It’s part of their spring seasonal range of beers and can be found both on tap and in bottles when on sale. So why is it a wheat ale? Well the brewers at Kumezakura Shuzo decided to make a wheat ale and then load it up with hops to the traditional range of 40 to 70 IBUs, with them using twice the amount of hops they use in their pale ale to make Daisen G Beer White IPA. A bitter wheat ale and not a wheaty IPA. Who’d have thought Japanese breweries could come up with something like this? Admittedly Daisen G Beer White IPA did first come back in 2009 it seems so it’s been hanging around for a while but with Kumezakura Shuzo’s herculian efforts in stopping most of their limited and seasonal beers from being widely available, it was a surprise to come across this in Le Petit L’Ouest. I can’t even find anything about Daisen G Beer White IPA on their online shopping page, with only a one-line entry in their online listing of seasonsal beers. And you know what? 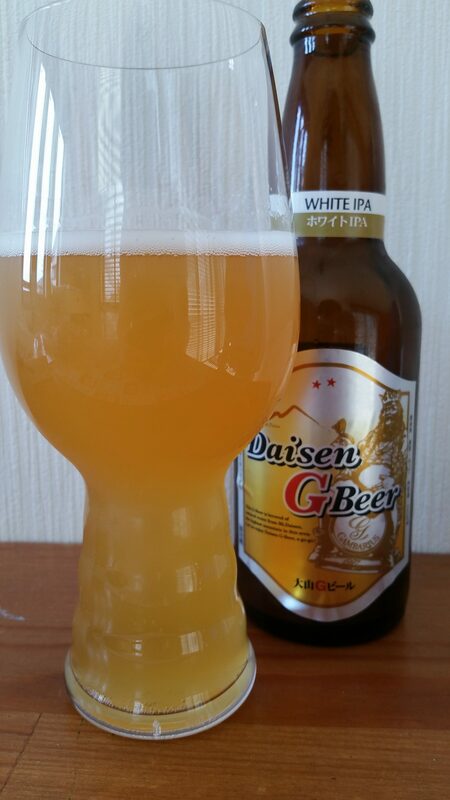 It’s a shame as Daisen G Beer White IPA had a wonderful citrus and orange wheaty aroma that was soft yet pleasing. It poured out a light hazy golden straw colour with a slightly frothy head on top that faded fast. Daisen G Beer White IPA had some hints of yeast floating around in the bottom of the glass but that could have been due to me picking the wrong bloody glass to use. The body had a interesting mix of yeast funk which contrasted nicely against the bitter citrus bite that lingered throughout drinking. And Daisen G Beer White IPA was complex to say the least. So many different flavours going on with oranges, wheaty, yeast funk, and a spicy bready bite to it. In fact, it kind of reminded of a hot cross bun though I would prefer to drink Daisen G Beer White IPA than a hot cross bun. All of these flavours may seem like a lot but they were incredibly well-balanced when chilled and when the beer was also warmed up. Perhaps the drinkers in Tottori don’t want Daisen G Beer White IPA to leave the area as it’s so nice but it’s definitely worth picking up if you can find a bottle. IF. I got my bottle of Daisen G Beer White IPA from Le Petit L’Ouest. I haven’t seen it online anywhere.